With showers forecasted in the afternoon it was an early start this morning. An additional bonus was all but one lock being in our favour. We must have started about 15 minutes ahead of the two boats moored in front because their crews appeared as we passed. The plan was to only go as far as the moorings below bridge 43A and stop. This would do a partial recharge of the batteries before removing the 175A alternator which has only been operating intermittently. 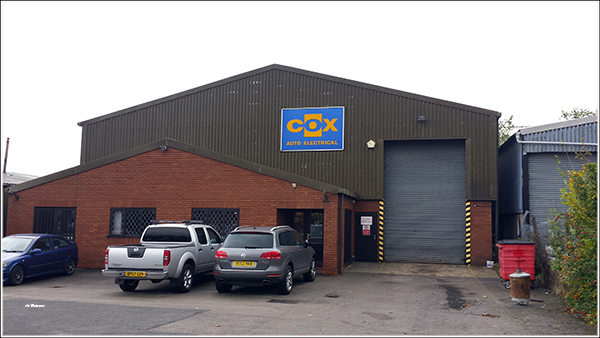 Cox’s Automotive is located in Atherstone and very close to the canal. The plan was for me to embrace the hot engine and remove the alternator for them to test and; if necessary; repair. Time spent in planning is seldom wasted and therefore I took a number of photos of the existing alternator connections before starting on the task. This isn’t a standard alternator installation. 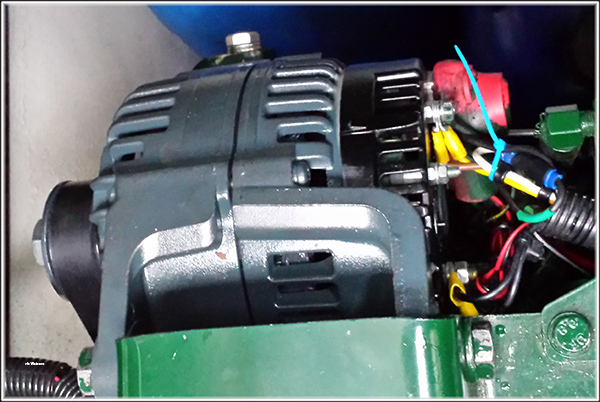 We have a Sterling Pro Digital Advanced Regulator (PDAR) wired into the alternator field coils. As I disconnected each wire it was tagged and photographed. The alternator was then removed and I again laid out the nuts, washers and bolts in the exact sequence they were removed. There were two wires for the PDAR protruding from the removed alternator. 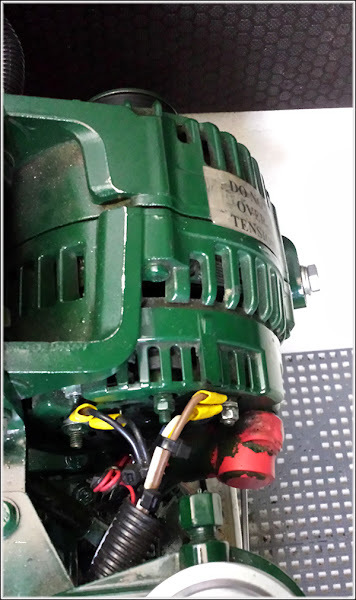 Only one is used and if the wrong one is reconnected then there is a strong possibility both the PDAR and alternator will be damaged. I took particular care when marking these. Paul (nb Waterway Routes) had sent me some information regarding a shortcut from the canal to Cox’s. I managed to follow his instructions and the route shortened the distance by half. Cox’s Automotive had asked me for details on the alternator. There is very little in the way of visible markings on the alternator however some Google searching provided what appeared to be the technical data. 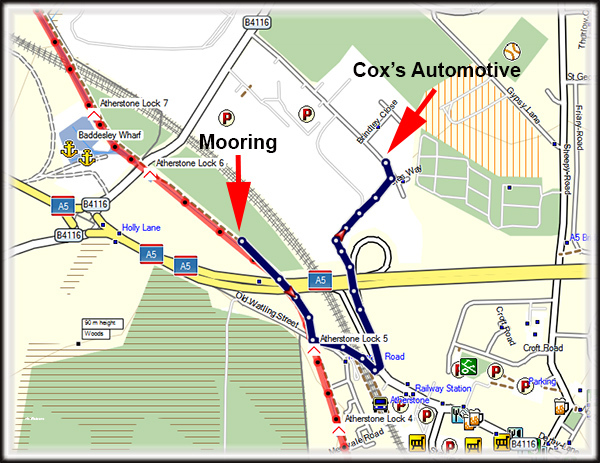 The alternator was placed in my backpack and off I went to Cox’s, arriving around 11.00am. They placed the alternator on test and after a few minutes told me it wasn’t producing an output. I explained the fault appeared to be intermittent. The helpful staff told me to leave the alternator with them and they would phone in an hour to provide an update. Good as their word, they phoned at 12.30 telling me that the stator windings and regulator were both defective. I accepted their verbal quotation to recondition the alternator and was advised to call back at 4.30pm to collect it. Arriving slightly early, I had a short wait whilst they finished with the alternator. I was quite surprised by its visual condition and initially thought it was a replacement. Everything had been cleaned down and it had been given a new coat of paint which was still slightly damp. New studs, washers and nuts! Once back at Waiouru I donned my “onesie” (overalls) and climbed back into a much cooler engine compartment. The alternator was carefully reinstalled in reverse order. My major concern were the two PDAR wire sticking out the back of the alternator cover and I had carefully questioned the staff at Cox’s to make sure they had labelled them exactly as I had when removing the alternator. As you can see, the alternator is now grey rather than the standard Beta green. I double, and then triple checked the wiring, before tensioning the belt and turning on the engine. There was an initial panic when the PDAR Bulk charge LED didn’t illuminate and less than 30 amps started going into the batteries. Then I realised the batteries were already 96% charged and in the Absorption stage. I’ll need to check the output of the alternator tomorrow morning to confirm everything is working correctly. The alternator connections were the start of my series of problems relating to alternators after the initial failure. 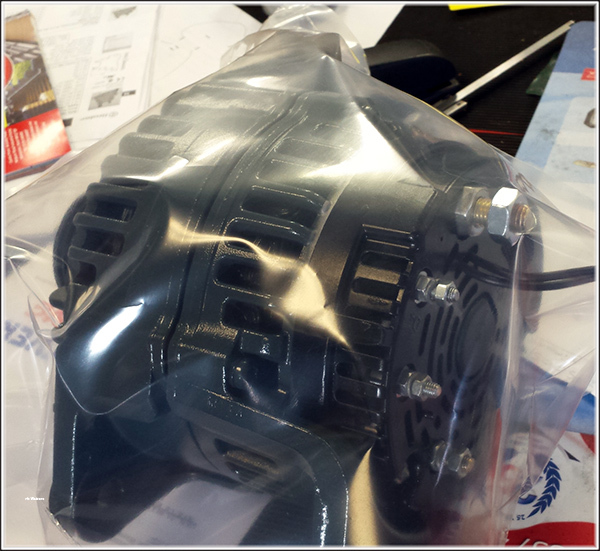 The so called pro that I employed to do my replacement in the first place got the PDAR wires crossed during installation of my new alternator, connecting the battery wire to the alternator and vice versa, causing damage to both the new alternator and the PDAR, with no recompense. I seem to attract these so called professionals, and no amount of research will identify them until it is too late. I now offer advice if you want a job done properly then always do it yourself. The canals have more cowboys than Texas. Doing it yourself you only have yourself to blame if it goes wrong. Such a pity it has to be like that though. I guess one of the advantages of being there everyday during the fit out was I know almost everything about the boat. There's a real problem with an almost completely deregulated industry! In Tom's defence, Peter, he went to an auto-electrical outfit, not a boatyard. But it was first modified and fitted by a boatyard. Not that I'm saying they did anything wrong. However I agree with Peter that using a boatyard increases the risk! Nice post Tom, seems great service from the guys at Cox's, I guess you did research on them to? Now for this morning and the shake down test, if I were a betting man I'd say it's going to be just fine 100%. Anyone reading this who doesn't have the knowledge or skill to do the job themselves could not do any better than to get in touch with Ed Shiers, Four Counties Marine - he is great - skilled, knowledgeable, responsive, gives excellent advice and keeps you posted on what he's doing and why. A guy with integrity and a pleasure to deal with. He has a large number of very satisfied customers who recommend him wholeheartedly. However they wouldn't allow me behind the counter to see what was going on in the workshop.